Bats have returned to Morgan's Cave! — International Field Studies, Inc. Bats have returned to Morgan's Cave! As some of our alumni may remember, there used to be bats present at Morgans Cave. The number of bats would vary from large groups (100+) to smaller groups (just a few), but in recent years we haven't seen any bats at the cave. We're not sure what the cause of this is, but the good news is that they are back! While visiting Morgan's Cave in mid-June with a group our staff noticed the presence of 15+ bats roosting. This caused a change of plans and the group was notified about the roosting bats and that they would no longer be entering the cave. The bats returning to Morgan's Cave is a sign of a healthy ecosystem and we're happy that the bats have been spotted at the cave again. To protect the bats located in Morgan's Cave, we will no longer be taking groups inside. Groups can still view the cave from the perimeter but everyone will need to keep a sufficient distance so the bats are not disturbed. We've also stopped taking groups to the "Bat Cave" which is also near Morgan's Cave due to fear of disturbing their habitat and the possibility of spreading white-nose syndrome. Although white-nose syndrome has not been detected in the Bahamas yet, we are still taking precautions. If you aren't familiar with white-nose syndrome, information can be found at Bat Conservation International. There have been 15 different species of bats found in the Bahamas, but two of these are only known from fossils, and an additional three species are documented from single specimens (which are likely vagrants that do not represent resident populations in the Bahamas). This leaves the current count of Bahamas bat species at 10 (Speer et al., 2015). The evolutionary history of Bats in the Bahamas is also an interesting one. DNA suggests that there are two sources of bats (Florida for the northern Bahamas and the Greater Antilles for the southern Bahamas) with a gene flow barrier occurring at the New Providence Channel. (Reed 2016). Waterhouse's leaf‐nosed bat (Macotus waterhousii) have been seen in the "Bat Cave" but we're still unsure what type of bats have repopulated Morgan's Cave. The Bahamian Funnel-eared Bat (Chilonatalus tumidifrons) is the only endemic bat of the Bahamas occurring on Abaco, Andros, and San Salvador. They are susceptible to disturbance due to their narrow range and small colony size and are considered to be a threatened species. 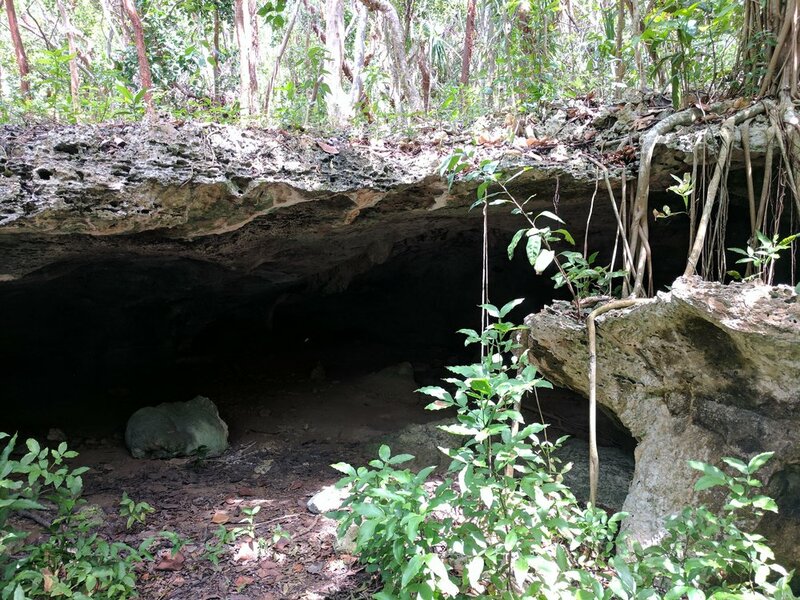 Since there is a possibility the bats in Morgan's Cave could be the Bahamian Funnel-eared bats, it is extremely important that we do what we can to promote the well-being of these bats. We will continue to monitor the activity of the bats when we are in the area and will provide you with additional updates if the situation changes.